Refugees registered with the Welcome Project at the British Red Cross in Plymouth are getting improved access to dental care and information, thanks to a project being carried out by a group of dental students from Plymouth University. Language and cultural barriers often leave refugees struggling to obtain the services they need, and dental care is no exception. 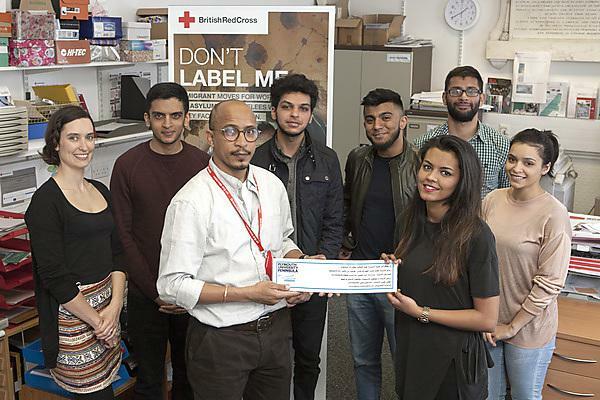 Working with the Welcome Project at the British Red Cross in Plymouth, a group of dental students have met with refugees in the city and identified the struggle they have trying to find dental care – with language being the biggest barrier. In response, the students have developed multi-language support material to help refugees access dental care and look after their own teeth, and arranged visits to Plymouth University’s Dental Education Facilities – specially-designed clinical environments where dental students treat NHS patients under supervision from qualified dental health professionals. They are also working with language societies at the University with a view to developing translation and interpretation services. The project is part of the Plymouth University Peninsula Schools of Medicine and Dentistry’s Inter Professional Engagement programme which sees dental students undertake a number of projects in the community designed to raise oral health awareness and to improve access to dental care. The programme is delivered by the Community Engagement Team at the Peninsula Dental Social Enterprise. The Red Cross supports refugees in a wide variety of ways, from offering emergency provisions to those facing severe hardship to giving orientation support and friendly advice to the most vulnerable.